The structure of Song of the Heart is also unique: Part One is a beautifully written, fictionalized version of the Vale family. Part Two, which takes place 21 years later, brings back the same characters and we see where their earlier lives have taken them. In Part One Matty, the patriarch of the family, suffers one of the worst childhoods since Oliver Twist, and we learn how his psychic scars affect his wife and children, especially his beloved daughter, Francine. What we do to each other, what we do to ourselves, has never been presented in clearer terms. This life-changing work of art could not come out at a better time: right after the New Year when so many of us have spent quality time with our extended families. The family actions and interactions in this epic tale will move you deeply while affording you insights into your own relationships. Francine Vale is an excellent interview subject on self-healing and all the topics mentioned above. 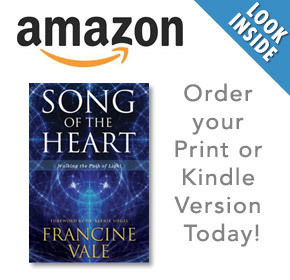 We would be delighted to send you a copy of Song of the Heart: Walking the Path of Light for possible review. Contact information is below for interview requests or further information. 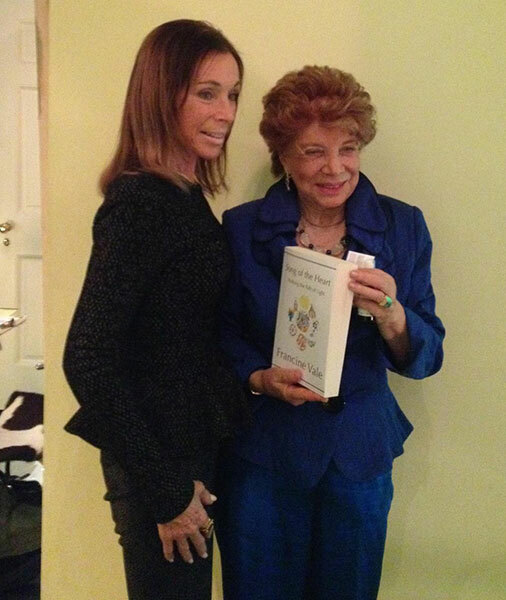 Francine Vale with author Carole Hyatt on November 20, 2013 at the NYC home of Ms Hyatt. Glamour/Business Headshot for beautiful Francine Vale. Her book A Song of the Heart at Barnes and Noble online and Amazon. is a must read for those who is in search of personal peace, love, and freedom. — at Juliati Boudoir Photography Studio.